Thinking of a great way to show your work as an Instructional Designer? Don’t miss the opportunity to stand out – do some ID portfolio benchmarking, and boost your academic and business prospects. Find some great market-tested samples in this article! Every seasoned Instructional Designer should consider making an elaborate portfolio of previous projects. Narcissistic inclinations aside, a well-balanced representation of your courses and projects may bring along a plethora of future benefits. What’s the use of an Instructional Designer portfolio? It encompasses your past and present skills, domain knowledge, subject matter expertise, educational background, and more. It gives your peers, employers and students a glimpse of your creative process, methodology and teaching techniques. It’s always good to have a portfolio handy once an opportunity pops up. By presenting your experience in a structured, tangible fashion, you get an edge over potential competitors who fail to submit any information at short notice. Another argument in favor of an ample portfolio is volatility. Today you are sweating over a complex long-term course, tomorrow the decision-makers cut the funding, and your valuable work is left behind. Keep your time and efforts well-documented, come hell or high water! Portfolios facilitate recruiters’ jobs and provide a great shortcut to the cherished interview, avoiding ordinary selection filters. Nice samples of your e-Learning courses and academic work will catch an employer’s eye. Plus, potential clients may get a sneak peek into your pricing and terms. That said, one of the common issues associated with portfolios is non-disclosure. Sometimes, you have no right to share your accomplishments in proprietary work with the community at large or third party organizations in particular. Try to find a workaround and describe a project from the perspective of your personal input, without dropping names or giving away classified information. A portfolio also reveals your soft skills and individuality to potential customers and employers. Don’t hesitate to throw in lively details, or an appropriate story regarding a specific instructional challenge. A personal slant will help you build a rapport with a broad audience and let people see the real author behind the courses. Here are a few picks from tons of instructors’ websites I found. In this selection, I’m trying to demonstrate a multitude of styles, layouts and approaches to building Instructional design portfolios. For clarity’s sake, I’m separating individuals from organizations. All works are conveniently grouped and labeled, drawing the line between e-Learning projects, games, performance interventions and evaluations. The portfolio includes password-protected content available upon request. Viewers have access to additional resources in PDF nicely placed under the description. This is an example of a simpler minimalistic layout, though neatly structured and logical. The content is split into multiple categories for better navigation. Embedded multimedia works fine with no broken links or outdated scripts. Jackie’s website is a classy representation of an e-Learning professional. Every case includes the following elements: project background, course features, published sample, solution and role description. An approach worth taking on board. The site itself employs a cloud of tags to facilitate searching for specific topics. A well-written practical portfolio featuring this expert’s stand-outs since 2004. A simple and clear WordPress layout ensures easy reading and neatly integrated multimedia. The content is granularly organized, with large thumbnails to give you a basic idea of the contents. This website is based on an eye-catching trendy theme. Each case study provides a project brief (type, date, customer) along with key attributes. Project previews lead to a Dropbox-based storage. The portfolio looks great on mobile devices thanks to responsive design at the core. This uncluttered portfolio lists brief previews of courses, projects and activities. Older cases are equipped with updates – materials are reviewed on a regular basis. All in all, it’s yet another nice WordPress site with social tools and sharing buttons, so interested viewers may spread the word about the expert’s experience. Rachel’s e-Learning portfolio features a wide range of projects linked with publications, quizzes, videos and other external content. Each project is assigned key attributes such as role and product. All works are listed on a single page and aligned for better navigation, so little or no extra scrolling is required. This portfolio was performed in Prezi, a visual non-linear presentation service. It’s a great way to showcase one’s experience as a multi-dimensional story with a wealth of user-friendly tools. Prezi maps all key accomplishments and projects of interest, preserving timeline and logical ties. A format well worthy of attention! A collection of e-Learning courses, storyboards, and videos, this portfolio provides a smooth browsing experience and quick access to the projects. Some works are presented as screenshots, others are packed into multimedia formats. The author uses Dropbox as cloud storage. 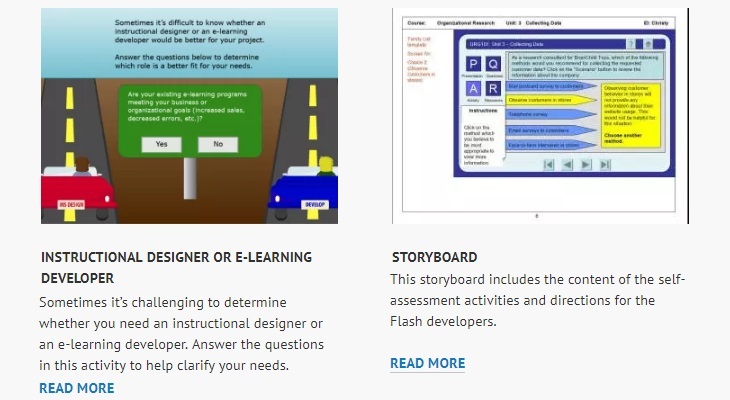 This gallery features Instructional Design, Project Management, and Gamification categories. All case studies provide a project description, customer name, and details on technology used. More information is available in .swf format. Kristin’s portfolio fits into a single page with minimum scrolling. The projects include customer details, tools employed, and time in development. All cases link to pop-up demos or embedded presentations. Dianne’s webpage has a simple layout and presents key projects in a bulleted list. It’s the stuff but not the fluff – a brief description with relevant illustrations along with a catalog of publications below. This is another no-frills portfolio providing access to projects in PDF and PowerPoint format. Simple, clear, to the point. Jackie’s page displays samples of instructional designs developed for a host of educational, business and non-profit organizations. The formula here is a basic test description plus a PDF to learn more. At the bottom of the page, you can find the author’s latest publications, separate CVs for academia and business, as well as links to social networks. The portfolio section on this website comes with education, technical expertise, skills, work history and awards. Prominent works are filtered by category: instructional design, graphic & web design, instructional presentations, video and instructional guides, writing samples, presentations and tutorials. The content opens in an embedded Flash player, or in a PDF file. Ginger’s portfolio is a mix of e-Learning, instructor-led training, job aids, etc. What’s peculiar in this project gallery is a category dubbed “Clicky-clicky bling-bling” where the author places experimental and incomplete jobs. For all projects, Ginger indicates the date and the technology used. The full content opens up as HTML5. Some case studies are password-protected for confidentiality purposes. This portfolio features an easy-to-navigate page that describes the designer’s experience in developing several types of eLearning resources. For each project, viewers simply hover over an image on the page to find a brief description. Clicking on a description leads to detailed information and access to the full project. Peck’s specialties include interactive courseware and xAPI implementation and consulting. Camille’s website has a simple design that allows the viewer to scroll and view samples of eLearning projects. Animation, educational games, digital textbooks, and mobile learning are some of the concepts the designer introduces in this portfolio. The designer’s approaches to instructional design and multimedia design are discussed in detail. This portfolio shows the full scope of this designer’s work. Meme’s graphic design background is evident as viewers experience the creativity and whimsical elements she brings to each project. The portfolio includes courses, games, websites, promotional pieces, and custom business cards. The site is easy to navigate by simply clicking on an image on the page. Upon entering this site, the viewer is introduced to Smith’s many roles: education specialist, freelance designer, instructional designer, and curriculum developer. The designer includes a resume that summarizes his experience and educational background. The portfolio includes examples and excerpts of learning objects that Smith has developed and references from colleagues. The unique feature of this site is that each time viewers click on an image to view a sample, they are taken back to Smith’s introduction, then they must scroll down to see the samples. This site is straightforward without a lot of distractions. At a glance, the viewer gets a feel for Dombrowski’s approach to instructional design. Navigating this WordPress site is simple, as the designer’s portfolio is accessible on the home page by clicking on the portfolio tab. Roberta offers several projects for review. She describes her creative process and offers project links to view specific courses or projects. This site showcases Houra Amin’s competencies through a sampling of short courses. The developer indicates that she is a skilled pedagogical practitioner with experience in analysis, design, educational technology, evaluation, and media. Upon clicking on links in images that represent the designer’s projects, viewers see courses and other learning objects in action. Amin shares the course authoring tools and other resources she uses in the design process. An archive of blog posts is available on each portfolio sample page. Clicking on this site brings a different result than some other portfolio sites. The site does not appear at first to be a portfolio. The “about” tab takes the viewer to information about Alexander Salas, a designer with experience in the healthcare and IT industries. The home page features a learning game, a demo, and a training course that viewers can experience. The “sample” tab leads to several short demos created in Articulate Storyline and Rise. The demos are colorful, interactive, and a good representation of the designer’s skills. Tausend is an instructional designer and educational technologist. This designer introduces her portfolio through a YouTube video which highlights several projects she has created. During the video, she shares her design experiences. She provides contact information, and also encourages viewers to visit her website. Tausend’s website portfolio features her video resume, video portfolio, eLearning tools with descriptions, and links to tools. Willis’s YouTube portfolio begins with upbeat music and simple visual elements that introduce her as an instructional designer with skills in Storyline, Captivate, Camtasia, Premiere, and Edge. Willis works with animation, develops presentations, and creates videos. Here, she shares demo snippets of pieces she has created. The portfolio includes statements from clients regarding Willis’s work. The video concludes with her social media contact information. Martin is an instructional designer and curriculum developer who begins with a 15-second video introduction to her portfolio. She then follows with her master’s portfolio where she shares what she learned from designing learning projects during her master’s program, and offers tips for teachers and others regarding instructional design tools and strategies. The video portfolio provides an excellent and thorough overview for anyone who is interested in pursuing a master’s degree or a career in instructional design or online teaching. Syzmanowicz shares a YouTube video portfolio that highlights a training course for healthcare professionals to help patients understand the benefits of colorectal cancer screening. The video is just over two minutes, and demonstrates how learners move through a module and assessment quiz. This portfolio is a virtual tour of the eLearning resources developed by Liberate eLearning. Set to music, the portfolio is fast-moving and technically savvy. It is evident that this custom eLearning developer has performed work for all types of companies, including major corporations. Interested parties can visit the company’s website for more information. This simple but cool site introduces Taylor Tomanio, an instructional designer, learning developer, and LX designer. Her portfolio features courses created for clients. along with learning resources of interest to experienced and aspiring instructional designers. Tonya V. Thomas’s Eductech Diva website describes her work in several areas, including educational technology, design, project management, and multimedia communication. Thomas’s portfolio includes a collection of work samples where the viewer can click on links to see interactive presentations. This is how colleges display their distance learning programs and course portfolios. All programs feature an instructor, method of delivery and description. No frills, pure information. The company’s website offers streamlined graphic design and structure. Every case study includes demos, external links, and customer quotes. All projects are presented in bulk, with no separate categories. Just a bunch of sample screenshots. However, this portfolio page has a disclaimer: more information will be available after registration. The projects here fall into the following categories: Health and Safety, Human Resources, Information Technology, Policy. Seven case studies encompassing challenge, solution, screenshots and an agreeable design. Various techniques. Do you only have linear slide-by-slide courses under your belt, or are there any interactive instructional design samples? If yes, make sure to add them to the list. Nice looks. Although this may not directly define you as Instructional Designer, the look and feel of the portfolio page makes a crucial impression on your viewers. Elegant imagery and a smart layout will sure earn you a few extra points. Content diversity. Make sure you showcase versatile courses ranging widely by content, style, approach, year of publication, etc. Clear descriptions. Keep your logic impeccable, guide the viewer from challenges and requirements through the solution and up to business/academic impact. Employed tools/software. Don’t forget to mention your favorite e-Learning tools, LMS, and authoring software to give the portfolio a professional flavor. Project roles and positions. Describe responsibilities within every project, accentuate your personal input. Confidentiality and IP. See to it that exposure of your work does not breach your previous employers’ confidentiality policies. By the same token, protect your own intellectual property from misuse – provide screenshots or safe links rather than original files. Academic/business paper samples. Supplement your portfolio with examples of your writing. This can be scripts, papers, publications, etc. Personal details. Your mission, interests and hobbies are an integral part of your professional brand. When sharing your experience as an Instructional Designer, focus on the practical value of your activities, as well as your capabilities for problem solving and executing complex projects from scratch. Go beyond your skills as a course author and throw strategy into the mix, matching employers’ potentials needs with your battle-hardened optimization scenarios. A perfect portfolio shows your prime accomplishments and the links between them – not the whole story with all its ups and downs. Choose carefully, and see if the projects on the list still comply with your active skillset. The target audience is another aspect worthy of consideration. You may need to come up with a couple or more portfolios to cater to different verticals. Is this a traditional school project or an e-Learning design opportunity that you have in mind? Do you need to highlight your business coaching activities? Factor this in for your portfolio. If you are thinking of a platform for deploying a personal website, try WordPress. It’s a market-tested engine used by millions of people, so you can’t go wrong. WordPress encompasses a host of free and paid plugins for every taste and budget, with decent customization options. Check out this nice guide to building up a WordPress site. Last but not least, always keep it up to date. Make regular updates to the description and review the portfolio based on new experience, certificates or challenges. Besides, edu technology evolves all the time, so you don’t want to appear out of touch mentioning obsolete tools. Crafting an Instructional Design portfolio may take up a good deal of time, but it pays off well in the long run. If you are looking to enhance your clientele and unlock new work opportunities, it’s definitely the way to go. In this video, Tom Kuhlmann defines and discusses the importance of having a professional portfolio and outlines the essential elements to include. Viewers learn that portfolios should have personal and professional value, as well as demonstrate technological expertise. The video also suggests using a portfolio for branding and for sharing work samples. Katrina Baker discusses what makes a good portfolio and how to use a portfolio during an interview. She recommends taking hard copies of sample projects to the interview because this allows the interviewer to have something in hand as the designer presents information about the projects. Those who view this video will find many helpful recommendations, including the importance of creating a unique portfolio for each job interview. I’m looking forward to your nominees for the ‘truly outstanding portfolio’ award. Found a great sample? Give me a shout in the comments, and I’ll add it to the list! ID Tips and Tricks What’s the Optimal Length of an e-Learning Course? It’s the perfect portfolio resource. Hi Jackie! My pleasure: I do like the look and feel of your website. If you have any more portfolio tips, let me know. Thank you Scott for the examples! I’ve seen some and and now there’s more to explore. Great resource! Thanks Zifang! Glad I could help in the search. Hey Scott, Thanks for listing my Portfolio. My pleasure, Cath! I wish I could see more portfolios like yours on the web. Hi Scott, thank you very much for all this great information! Interesting Post! You share great examples of Streamline instructional design portfolios. Keep sharing! Great post, saw this last year and came back to it again for guidance in updating my portfolio. Thank you! Btw, #11 brings me to her website but not a portfolio, possible it was removed or moved to another location? #5 and #12 links did not work either. I tried the root/index site for each link and those did not work either. Guessing those sites no longer exist? I did not Google the names to check.